Air Canada Vacations has announced it will be offering cruises sailing from Martinique on board the Costa Magica. Starting 27DEC, 2018, the Costa Magica will set sail every Thursday from Fort de France offering seven-night alternating cruise itineraries that will visit the islands of Guadeloupe, Grenada, Tobago, Barbados, Tortola, St. Lucia, St. Maarten, Antigua, and Saint Vincent & Grenadines. Fully refurbished in 2017, with 1,358 cabins (464 with private balconies and 58 suites), the Costa Magica offers a choice of four restaurants, 11 bars, a wellness spa, four pools, a waterslide, five hot tubs, and an outdoor jogging track. Pricing on flight & cruise packages from Toronto start at $1,399 per person and travellers can choose from two seven-night itineraries or combine them for a 14-night cruise. 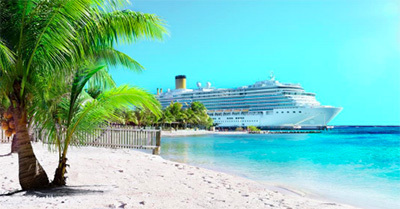 “As a new option for our clients, we are so excited to be offering the recently refurbished Costa Magica sailing for seven or 14 nights from Martinique with flights on Air Canada Rouge with very affordable prices,” said Christine Chiang, manager, product development cruises.